“Trick or treat, smell my feet, give me something good to eat. If you don’t I don’t care, I’ll pull down your underwear!” Well, we wouldn’t want that to happen now would we?! Here are five fun Halloween recipes to give everyone something good to eat and keep your underwear up! Can’t go wrong with sweet potato fries! 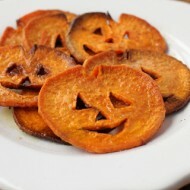 What better way to decorate your Halloween party than making Jack-O-Lantern Sweet Potato Fries! This is a cute take on Pigs In A Blanket, but with some Halloween spook! 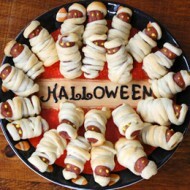 Mummies In A Blanket is a great idea for appetizers at your next Halloween party! 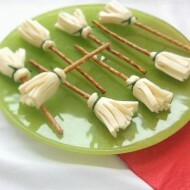 Cheese Witch Brooms is another cute appetizer recipe for your next Halloween party! The recipe is in Spanish at first, but the English version is also available further down. Now onto the desserts! 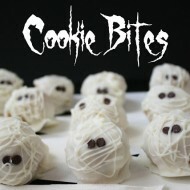 Mummy Cookie Bites is a such a simple recipe but makes for a very sweet and easy treat! Who hasn’t made Rice Krispies?! 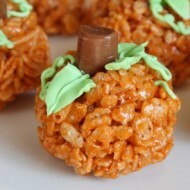 This Pumpkin Rice Krispie Treats recipe adds some Halloween fun! Do you have any Halloween recipes that you love to use? Share them with us in the comments! Happy Halloween! I think I found Michael Jackson’s glove?